Russet potatoes are one of the most popular brown-skinned spuds available. Red-skinned potatoes refer either to varieties featuring a thin, red-pink outer layer at maturity, or to “new” potatoes of any type, because most potatoes have red skins when they are still at the small and round stage. The Centers for Disease Control and Prevention recommend brown and red potatoes for their superior vitamin C, potassium and fiber content. 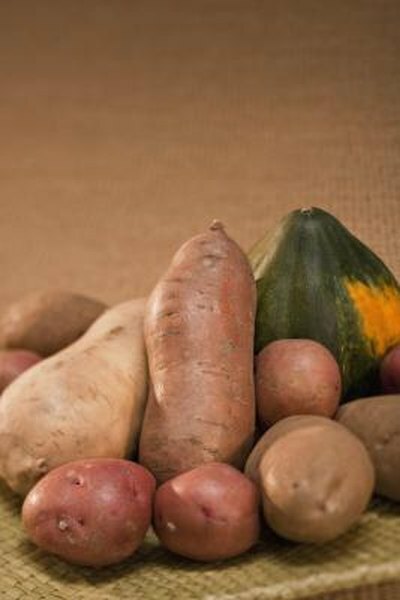 Russets boast a slight edge in some nutritional categories, especially fiber. The same size servings of russet and red potatoes contain similar fat, calorie, sodium, protein and carbohydrate counts. A medium-sized russet has 168 calories and .04 grams of saturated fat. A red-skinned spud of the same size has 154 calories and .04 grams of saturated fat. Brown potatoes contain 37 grams of carbs and red potatoes contain 34 grams of carbs. Russets are also slightly higher in protein, offering 4.5 grams of protein compared to the 4 grams of provided by a red-skinned potato. Both types take up about 1 percent of the daily allotment for sodium. The thicker skins of russet potatoes translate into a superior choice for dietary fiber. One medium-sized russet offers 4 grams of fiber, compared to the 3 grams fiber contained in a red-skinned potato. In practical terms, a brown potato provides 16 percent of the daily value for fiber, compared to the 12 percent DV in a red-skinned potato. Both are good dietary choices for fiber, provided you don’t peel them. Fiber-rich foods help lower cholesterol, keep your blood sugar level steady, promote digestion and support weight loss by helping you feel fuller more quickly. The two potato types are virtually the same when it comes to vitamin content, although russets offer almost twice the amount of vitamin B-6. Red-skinned potatoes are high in vitamin B-6, at 18 percent of the DV, but russet potatoes, which provide 31 percent DV, are an even better choice for people aiming to boost B-6 intake. Both potatoes provide about 36 percent of the DV for vitamin C. They are also good sources of vitamin K and of some B-complex vitamins in addition to B-6, including folate, niacin, thiamin and riboflavin. Russet potatoes are equal to or slightly higher than red-skinned spuds in mineral content, with the exception of copper. Both types are excellent sources of potassium, providing about one-third of your daily needs for the mineral with every medium-sized potato. Russets have 3 percent of the calcium DV and 10 percent of the iron DV, compared to the 2 percent calcium DV and 7 percent iron DV contained in red-skinned potatoes. Both types provide about 12 percent of the DVs for magnesium and phosphorus, and 4 percent of the DV for zinc. Red-skinned potatoes beat out russets in their copper content, at 15 percent of the DV to 9 percent of the DV, respectively. Brown beats red in manganese, with russets delivering 20 percent of the daily amount of the mineral and red-skinned potatoes providing 15 percent.